With this plug in TV Stick, you get a fully functional digital television and personal video recorder that fits into your pocket when you arenâ€™t using it. It will receive both Analogue NTSC and Digital ATSC transmissions, stream HDTV pictures through the high quality screen on your laptop, and allow you to record and playback television whenever you want. Thanks to the full function remote control, you can even change channels, call up a comprehensive interactive TV guide on screen, without having to press a button on your keyboard, allowing you to enjoy TV on the go whenever you want, and wherever you are. With the Pinnacle TV for Mac HD Stick, you will be able to get all the functions of a top quality media centre PC with personal video recorder capability in a laptop. It offers an excellent solution to anyone wanting entertainment wherever they are. Easy to use, and stylish enough to get it out in public, this device extends the functionality of your Mac to let you combine work and pleasure, and even allows you to run TV in a small window on the desktop to allow you to keep an eye on an important game, or your favorite show, but have to work, you can do both at the same time. For more information about the Pinnacle TV for Mac HD Stick, visit Pinnacle’s website or click here for consumer reviews . 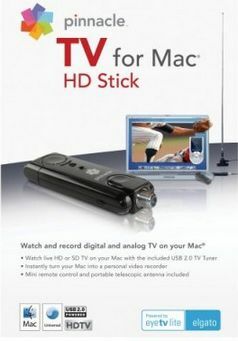 The Pinnacle TV for Mac HD Stick is retailed at $129.99. esto quiere decir q si conecto el usb en mi imac yo podre conectar cualquier cable de television y ver tv? no importando en el pais q me encuentre??? ?